The reputation of the wines of Mount Etna, the enormous active volcano that dominates the north-eastern corner of Sicily, has shot up in the last few years. It is now known as one of the best wine-producing areas in Italy; I think correctly. Ciro Biondi's family has owned vineyards in this area since at least 1800, and first sold bottled wine under their label a century ago; the modern iteration of the Biondi winery started in 1999. Ciro (an architect by training) and his wife Stef own three vineyards near the small town of Trecastagni, and have reworked an old palmento in one of their vineyards as a winery. Barrel storage is in the little old cellar of the family house in the center of Trecastagni. Once the overall reputation of an appellation is established, the next step (particularly for an area as large as Etna) is to find out how the parts of the appellation differ. 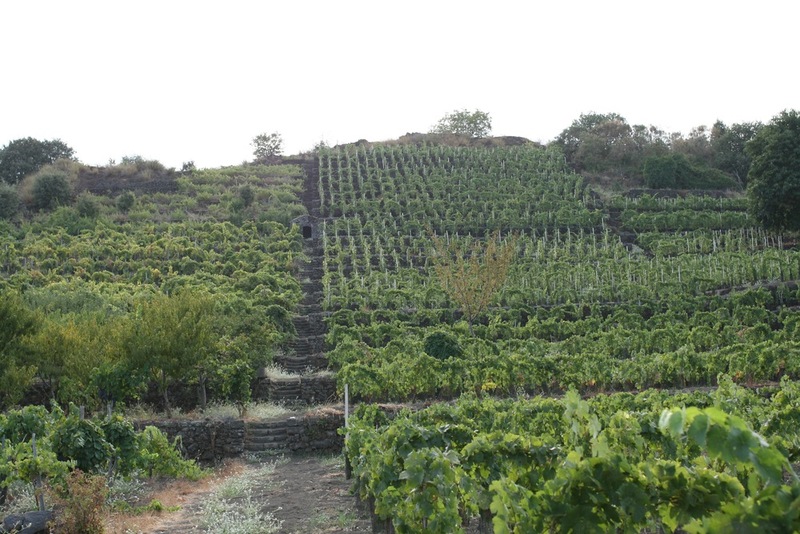 Biondi's cellar and three single vineyards are on the south-east slope of the volcano, in Trecastagni. 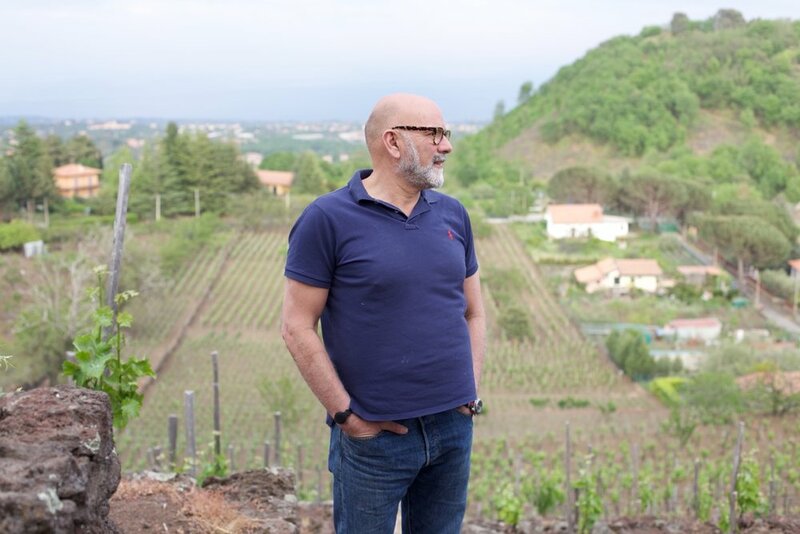 At the moment, the wines grown and produced on the north side (such as Passopisciaro and Terre Nere) are better-known, but in my view this is because there are more established producers there, not because the wines are better there. (Historically, the south side was better known than the north.) The south side of Etna tends to produce wines that are more subtle, more Pinot-like, often paler in color than the north side (and for this reason often blended with Nerello Capuccio, a darker variety than Nerello Mascalese, the predominant variety in all Etna Rosso); the northern slope of Etna produces wines that are more structured and darker. I like both styles, and I think time will show that the very best wines from Etna will come from both sides of the mountain. Biondi's wines are now unquestionably in this top echelon, and they are improving every year. 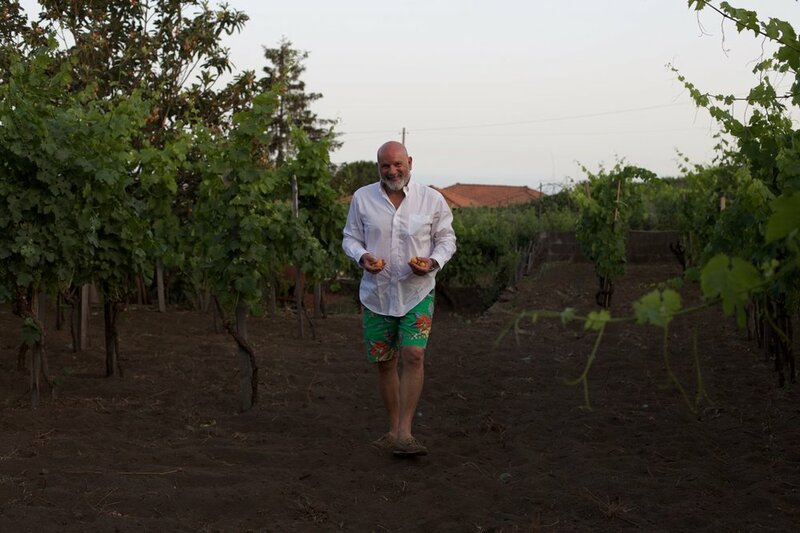 Carricante, an intriguing white indigenous grape variety with a distinctive stony minerality, is blended here with several other more aromatic local varieties, including Moscadella dell'Etna. The combination ofbright acidity and minerality from the Carricante and the complex aromatic notes from the other varieties come together harmoniously in the glass. (Unblended Carricante can be almost too lean and minerally.) Notes: bright pale straw color; aroma of wet stones, with hints of flowers, peach, apricot and herbs; very flavorful palate impression with lively balancing acidity. Production Zone: South East Mt. Etna, Trecastagni. Vinification: fruit is picked into small boxes, pressed immediately, then fermented and aged for about 8 months in stainless steel tanks. Etna Rosso is made of Nerello Mascalese, with the permitted addition of up to 20% Nerello Cappuccio, of which Ciro Biondi takes full advantage. This is the most elegant wine I have tasted from Sicily, and one of the best; it shows an almost Burgundian combination of finesse and substance, leaving a wonderful lingering impression on the palate . The wine shows no overt oak, only excellent, clean and balanced winemaking. Notes: light-medium red Pinot-like color; aroma of red and black fruits, with balsamic hints; medium weight on the palate but very flavorful and long on the finish, excellent balance. This wine has far more weight and complexity than you'd expect from the relatively pale color (as is true of Pinot Noir and Nebbiolo, of course). Soil: Sandy, volcanic, rich in minerals with low acidity. This is declassified, mostly from estate vineyards with small amounts of fruit bought from Ciro’s cousin and a friend of his father. Vinification is the same as for the single vineyard wines, the grapes are destemmed, crushed, then fermented and left on the skins for a total of about 10-12 days depending on the vintage. 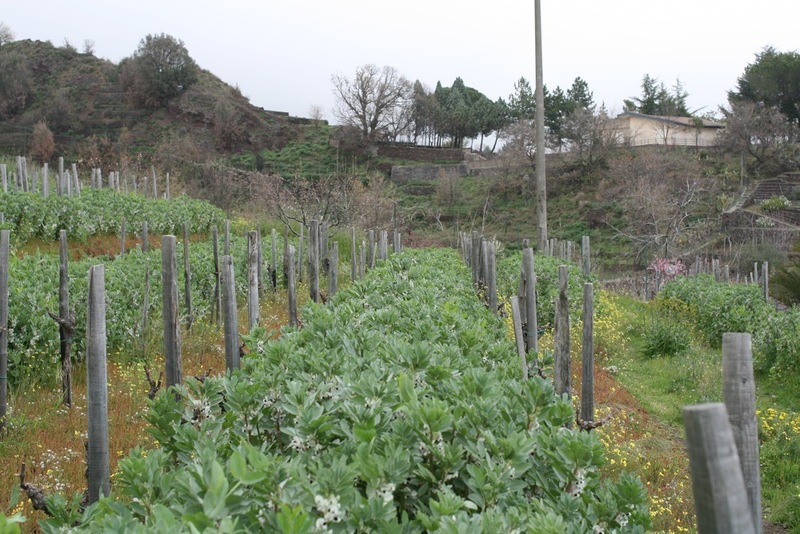 Vineyard Details: 2,5 hectares in Contrada Ronzini. Name of the vineyard “Chianta”. Owned by the Biondi family since at least 1800. The name “Chianta” means to plant in Sicilian dialect. The vineyard lies on the side of a steep terraced crater, dating back thousands years. The supporting dry stone walls were built by Cirino Biondi, Ciro's grandfather. Agriculture: Organic fertilizers used, with three treatments of sulfur and copper from May to August. Wine-making: Pruning with the waning moon, manual harvest. Grapes are typically harvested in October, selected and placed in small cases to be transported whole to the winery where they were destemmed and left at a temperature of below 9°C in stainless steel vats for 24 hours. After pressing and clarification, the fermentation takes place at a temperature of 18*C in used barrels of 225 liters for at least 2 weeks, Batonnage weekly for 8 months, bottled the following June. Vineyard Details: Two hectares in Contrada Ronzini. “Cisterna Fuori” (outside tank), is the name that the family uses for the vineyard, which has been owned by the Biondi family for many centuries. The vines lie on the side of a spent crater, which dates 125 B.C. and is very steep with supporting dry stone terraced walls. The soil is very rich in iron especially on the top, where there is red pumice. Ciro and Stef Biondi were married in the very heart of this vineyard in 2004. Wine-making: Pruning with the waning moon, manual harvest. Organic fertilizers used, with three treatments of sulfur and copper from May to August. Length of maceration: 10/12 days on the skins. Malolactic fermentation in carried out in 225 liter barrels, almost all used, then the wine is aged in the barrels for at least one year, bottled in March. Aging potential: best after 4 - 5 years, but will age for years thereafter. Vineyard Details: “San Nicolo’” 1/2 hectares in Contrada Ronzini, this vineyard was owned by Angelina Biondi, great aunt ofCiro, she was a fantastic person, died at the age of 99, with a great sense of humor and young spirit. The vines lie on the side of a spent crater, which is 12.000 years old and is very steep with supporting dry stone terraced walls. The soil is very rich in iron especially on the top, where there is red pumice. All the vines in this vineyard are ungrafted. Wine-making: Pruning with the waning moon, manual harvest. Organic fertilizers used, with three treatments of sulfur and copper from May to August. Length of maceration: 10/12 days in their skin. Malolactic fermentation in 225 liter barrels, almost all used, then aged in the barrels for at least one year before bottling. Bottling in March.